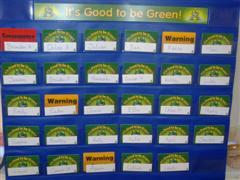 As part of our behaviour management in classes, we run a system called Good to be Green. 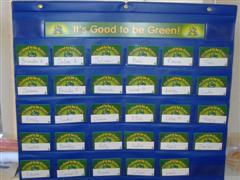 At the start of each week all children are on green(see fig 1). If they break the rules which have been set by the class they can be moved to a warning amber card(see fig 2). If there is continued or serious incidents happenening then it may be appropriate to move the child to a red consequence card(see fig 3). There can be movement up the scale if children show improved behaviour over the week. So for example, a child who has been moved onto amber can get back to green if their behaviour improves over the week. On Friday all the children who are still on green get a free choice of activity for 30 minutes. This may be anything from colouring, to learning new games or playing with toys. All those on amber will lose 15 minutes of this time and be made to work with a senior member of staff before going to their choice of activity. Those on red will lose the full 30 minutes and not take part in any of the activities. On Monday everyone starts back at green. If children are repeat offending and after 3 weeks have missed all activities then a letter will be sent home to parents inviting you to come into school to discuss and resolve the problem. For any more information or clarification on the scheme, please feel free to come in and discuss it further with your childs class teacher. Fun developing our writing at school. Some of our infant children are working on a project to develop their writing skills. After 12 sessions working with author Pippa Pixley we will be the proud authors of a published book. Every session is fun, and we have used i-pads and digital cameras to develop our ideas for story telling. We have made puppets, and explored outside to find ideas. We love Pippa's visits to Padiham Primary School. Sometimes our grown ups from home come and help us too. Green Time is a system we use throughout school to reward the children. All the children start the week on Green and those who manage to stay on Green receive 30 minutes of reward time on Friday afternoon. Amber cards are given for in incident which demonstrates inappropriate behaviour either in class or out on the playground. 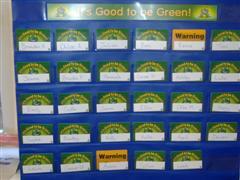 The Amber card can be returned to Green when excellent behaviour is demonstrated. Red cards are given when a serious incident has taken place. A Red card cannot be returned to Green but can be moved back to Amber. At the end of the week, any pupil on an Amber card will miss half of their Green Time and pupils on a Red card will miss all of their Green Time. Lets all aim to be Good To Be Green! Our Crown Green Bowling lunch time club is run by Miss Starkie! Our sports crew have done a fantastic job this year organising dinner time activities for foundation and KS1 children. Here are a few photo's of our Crown Green Bowling lunchtime club run by Marcin, Max and Bradley, the children can be seen celebrating and having lots of fun! The Year 5 and 6 children were invited to Shuttleworth to partake in an athletics event hosted by the sports leaders. The children tried their hand at shotput, put through their paces in relay races and participated in the long jump. The children thoroughly enjoyed the day along with Mr Chambers, Mrs Derbyshire and Mr Leyland, and showed the children and teachers alike at Shuttleworth their sporty side. Many thanks to the staff and pupils at Shuttleworth for hosting us for the afternoon. Honey, Bradley, Holly, Max, Bethia, Tyler, Kelsey and Mason. The BYA's and the SSOc have done a fantastic job running the lunchtime multi-skills club for our infant children over the past year. Well done to our inclusion orienteering team Oliver, Nathan and Joshua. You found all eight check points around Sir John Thursby's grounds and for your fantastic teamwork and mapping skills you all were rewarded with a gold medal each! Well done boys! At Padiham Primary we are very fortunate enough to have some fantastic eqiuipment in and around school. Here you will find some superb pictures of the year 3 and 4 children practising their Gymnastics balances and travelling on our climbing frame, benches and our very own vault! Over the past week Padiham Primary's Netball team have taken on St Leonards, Wellfield and St Mary Magdalene's to be undeafeated, winning two of their games and drawing one. Our Netball team work hard by using their own break times and dinner times to train and they even help with the umpiring of year 3/4 games to improve their Netball rules knowledge. Fantastic effort from you all! Let's work hard to try and get through to county finals next week, you can do it! Congratulations and well done to our year 5 and 6 girls and boys Cross Country team. Your hard work and commitment to your training with Miss Knightley and Mr Dunderdale has well and truely paid off. Our very own year 5 sports crew pupil Holly pushed herself in the elite race to come 3rd place, she never gave up and even sprinted the last 50 meters winning the bronze medal. Well done to you all for all of your hard work and effort! A super perfomance from all the Cross Country Runners at Townley Park this week! The Girls ran on Tuesday with fantastic finishing positions resulting in the team finishing 3rd out of 15 schools. The boys then ran on Wedneday and finished 5th!! Overall Padiham Primary came 2nd!! Brandon, Brandon, Grace, Lilly and Libby were part of the top 50 children who are now through to finals on the 30th April! A HUGE WELL DONE to all children that took part!! The government have provided schools with funding to improve sports and PE within schools. Please read the information above to see how we are using the extra funding to improve children's experience in sport and PE. Lots of children are already enjoying the wider range of extra curricular on offer at Padiham Primary this year. If you are interested in joining a sports club then take a look at the sports club timetable to see whats on offer this term. Take a look through the sports pages to see the children in action! The Dodgeball team had lots of fun at a Padiham Schools Dodgeball Competition. They won 5 out of 6 matches resulting in a tie with St Leonards. After a very close 2 minute playoff match Padiham Primary WON!!! Well Done to the Dodgeball Team!!!! On Monday 11th November the Girls Football Team enjoyed a super foorball match against Wellfield Church Primary. The girls played 4 mini matches, winning 3 of them. It was a super night of football and it was very nice to see so many people there supporting them. Thankyou! Well Done Girls!!! The Rugby Team were undefeated in the first round of the Burnley Schools Competition. We will play the final round at the end of November. Introducing our New Bronze Sports Ambassadors, Grace Turner and Luke Watmough! They attended some training with Craig Heap, a Youth Sport Trust Athlete Mentor and ex international gymnast. Craig was part of the GB team that went to The Sydney Olympics and he captained the GB Gymnastic Team to win Gold at the Commonwealth Games. He was a fantastic role model for the new sports ambassadors to learn how to become great sports leaders at Padiham Primary. They will be looking to recruit a Sports Crew to help them out so watch this space!! The Netball Team had a great time at their first netball tournament at Shuttleworth. Five schools entered and we were undefeated! Drawing our first three matches and winning our fourth. We finished 3rd!! A BIG well done to the team!! All the children who had 100% over the last term had a real treat when an ice cream van came into school. Each child, as part of our reward system, received a free ice cream. I don't really think it was ice cream weather but that did not stop the children!! We like to be busy. We use the laptops, we play games, we go outside and we sing songs!